“Maudie” (2016 production, 2017 release). 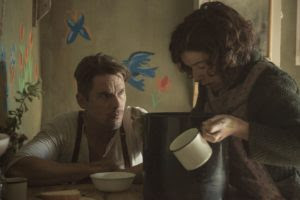 Cast: Sally Hawkins, Ethan Hawke, Gabrielle Rose, Zachary Bennett, Kari Matchett, Billy MacLellan. Director: Aisling Walsh. Screenplay: Sherry White. Web site. Trailer. Canadian folk artist Maud Lewis (nee Dowley) (Sally Hawkins) (1903-1970) faced a number of challenges in her life. As a child, for instance, she was severely afflicted by juvenile rheumatoid arthritis, a condition that left her body contorted and prevented her from engaging in many everyday activities, a condition that carried on into adulthood. Given her physical state and a perceived inability to care for herself, Maud was faced with having to move in with her Aunt Ida (Gabrielle Rose) after the death of her parents and the sale of the family home by her brother, Charles (Zachary Bennett). But, in light of the considerable restrictions placed on her by her aunt, Maud vowed to follow her impulses and make her own way, not an easy feat in the small town of Digby, Nova Scotia during the 1930s. Before long, Maud took a job as a live-in housekeeper for a local fish peddler, Everett Lewis (Ethan Hawke), whose shabby, remote, one-room house in nearby Marshalltown was sorely in need of attention (not to mention a good cleaning). Maud did her best to spruce up the place, though that task proved difficult, given her physical state and the fact that Everett seldom outlined his expectations. Maud’s tight-lipped, frequently grumpy, often-inscrutable employer gave her little to go on and even became abusive when she didn’t live up to what he wanted. But Maud would only take such treatment for so long; despite the potential consequences, she eventually issued an ultimatum, threatening to leave if things didn’t change. Realizing that he stood to lose a lot, Everett backed off, especially once he could see (and quietly appreciate) everything that Maud was attempting to do. That included brightening up the home by adorning it with her painting, a skill taught to her years earlier by her mother. Her collection of brightly colored images brought the dingy structure to life. 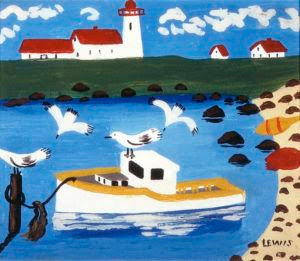 She also began creating holiday cards that Everett sold to those who bought his fish. 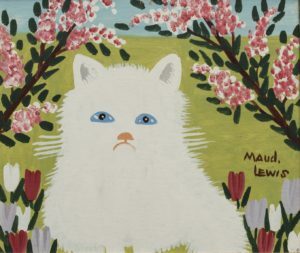 In no time, Maud developed quite a following, especially when she was commissioned to begin painting larger pieces by an affluent Gothamite who spent her summers vacationing in the area, Sandra (Kari Matchett), a warm, compassionate soul who would become a long-term friend. 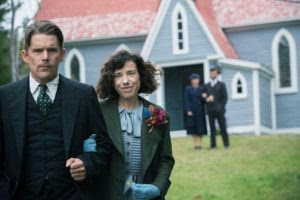 Maud Lewis (nee Dowley) (Sally Hawkins, right) takes a job as a live-in housekeeper for a demanding, inscrutable boss, Everett Lewis (Ethan Hawke, left), in “Maudie.” Photo by Duncan Deyoung, courtesy of Sony Pictures Classics. As time passed, Everett began viewing Maud as someone other than his housekeeper. Though still largely emotionally distant, he eventually managed to work up the nerve to ask her to marry him. And, given her growing artistic reputation, he soon saw the value in that, taking over most of the housework, leaving her free to paint. Maud subsequently received much attention in the Canadian media, including the CBC, which featured her works in a 1965 broadcast of the documentary TV series Telescope. 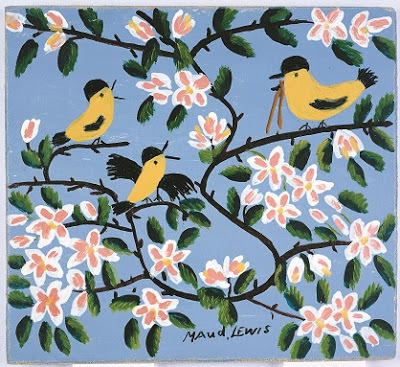 Her paintings also became favorites of such notables as Richard Nixon. All in all, not bad for someone whose prospects were at one time seen as quite limited. But Maud should credit herself for taking the initiative to overcome her constraints. She believed she could do better than what others told her she was capable of, and that attitude went a long way toward galvanizing her determination and charting her path to success. That kind of outlook is crucial to making effective use of the conscious creation process, the philosophy that maintains we manifest the reality we experience through the power of our thoughts, beliefs and intents. And, given the potency of Maud’s beliefs, it’s no surprise that she went on to achieve what she did. In forming her success-oriented beliefs, Maud drew upon a number of important conscious creation principles. For example, she was obviously quite adept at envisioning possibilities for herself that positively shattered the condescending outlooks thrust upon her by her brother and aunt. This came in handy when it came to getting a job, and then a vocation, and then a husband, all of which others were certain she would never attain. In addition, Maud effectively used her beliefs to draw to her the resources she needed for success. This is the law of attraction – the alternate name for conscious creation – at work in all its glory. Through her manifestation efforts, she attracted supporters like Sandra into her life, backers who helped spread the word about Maud’s art and contributed significantly to the development of her reputation. Similarly, that notoriety subsequently captured the attention of the media, whose coverage led to even greater exposure and the interest of high-profile patrons. To a great degree, much of Maud’s success comes from following her impulses, those intuition-based beliefs that tell us to proceed with pursuing particular objectives no matter how irrational or illogical they may seem. This is a key consideration to making conscious creation work – and one at which many of us often drop the ball, because the ideas are seen as silly, capricious or wrong-headed. However, given that these notions come through to us unhindered, we really should pay attention to them, because their appearance in our consciousness demonstrates their ability to break through barriers, the very same goal we seek to realize when we attempt to overcome our own limitations. The relevance of this should be obvious, and we’d be wise to recognize it as such. After all, Maud did, and look where it got her. Despite Maud’s prolific output, she never really made much money from her art, but she achieved tremendous personal satisfaction from it. That’s because she was sincerely following her calling, using her beliefs to fulfill her dreams. By infusing her endeavors with such a heartfelt degree of integrity, her personal success naturally followed – and it showed, not only in her art, but also in her outlook. By being true to herself in this way, Maud came to epitomize the concept of value fulfillment, the conscious creation principle associated with being our best, truest selves for the benefit of ourselves and those around us. 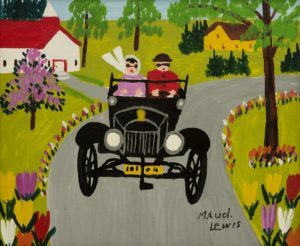 Her works came to be cherished as national and provincial treasures, even earning her the reputation as Canada’s Grandma Moses. 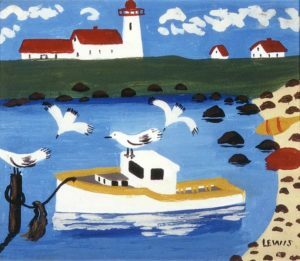 Those paintings, some of which appear below and are prominently featured in the film, are today housed in the permanent collection of the Art Gallery of Nova Scotia, along with the colorfully decorated home she created for herself and Everett. Quite a testament to someone who wasn’t supposed to accomplish much in life. “Maudie” is a charming, albeit somewhat overlong and occasionally uneven biopic about an artist whose inspiring life story serves as a shining example to those who are unwilling to settle for whatever scraps life might throw our way. The film features what are arguably the finest performances ever turned in by Hawkins and Hawke, as well as beautiful cinematography and fine period piece production values spanning several decades. Admittedly, some sequences are a little drawn out, while others are underdeveloped and in need of more back story, shortcomings that keep a good film from being a great one. However, given the uplifting nature of this story, it’s well worth a look for those who seek to overcome their limitations and to realize what it means to attain the kind of success that they thought was beyond reach.